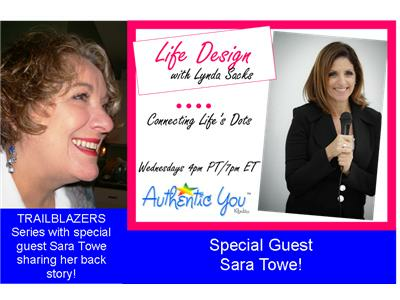 Life Design: Trailblazers Series with guest Sara Towe! This week the featured Trailblazer is Sara Towe! Sara will share her back story complete with the trials and tribulations of being a true trailblazer! I am Sara Towe and I have been teaching, counseling, and guiding people my whole life. I have walked the walk and had many ups and downs on my journey. But I believe in life, living it embracing it and being all I can be not matter the fear, trepidation’s or obstacles that will be in my way. Don't miss a single episode of the new series TRAILBLAZERS with host Lynda Sacks! Interviewing ordinary people affecting the world in extraordinary ways.